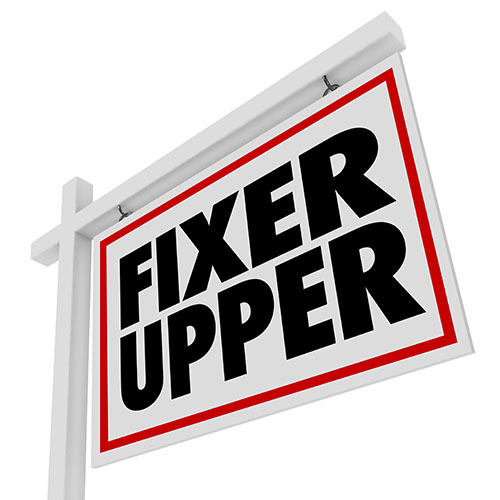 Fixer uppers can come with huge price benefits and opportunity, as well as problems. Make sure you understand what you’re getting yourself into before you purchase a home that needs significant restoration. Do the math very carefully before jumping in. Add up the expected renovation costs based on a thorough evaluation of the property. As some of the expected costs will lie within a grey area, it is important that you base your estimation on the higher end of the price range. Be sure to account for all materials and labor. Once you have calculated your expected renovation costs, subtract this number from the home’s projected post-renovation market value. It is important that you base this projection on comparable listings in the same neighborhood. Consulting a real estate professional can offer very valuable assistance with this step. To be conservative, deduct at least another 10 percent for any unforeseen costs, mistakes, or issues that arise. That final number should be the highest offer you make on the property. When looking for a fixer upper that is a sound investment, make sure that you have a solid team of professionals to work with. Choose a real estate agent who is familiar with the area and type of property that you are interested in, and make sure that all laborers you hire are not only competent to deal with the problems that you’ll face during renos, but who won’t cut corners. Aesthetically appealing housing don’t always pass inspections – it’s important to make sure that the property is fit for sale or it may never close at your asking price. If you’ve managed to find a home that’s in great condition but is visually unappealing, you may have found yourself an excellent fixer upper. Ugly carpet, old appliances, and tacky wallpaper are easy fixes that won’t eat up much of your budget or your time. Asbestos, leaky water lines, a cracked foundation, or a rotted frame are examples of more significant issues that will require the help of a professional. Be wary when investing in a property that has one or several of these problems, as they are the kind of issues that snowball into larger costs and a longer timeline for repairs. Ready to invest in a great fixer upper and tackle it as your next investment? Move forward with the help of your trusted mortgage professional today.